How to link them to the workings of the systems approach? Inter-relationships “So it’s all about inter-relationships?” somebody asked me, after I had tried to explain the systems approach. “Well, yes,” I replied, “but it’s also about Kauffman’s rules of thumb and Meadows’ leverage points. And about key stakeholder perspectives, the unavoidability of deception, debating system boundaries, and the collaborative design of a systemic intervention. And if we insist it is mostly about inter-relationships, it is very important to clarify what the concept stands for.” So that’s what I am going to do. Everything else follows from there. Whole system rationality In the simplest sense, inter-relationships are the connections between components or agents within a situation. Now, the systems approach is about figuring out which inter-relationships matter and how they matter. So, it’s about meaningful inter-relationships. Meaningful here means that an inter-relationship is relevant to the wicked problem at hand and the systemic intervention that needs to be designed and implemented to address it. This is also known as whole system rationality. A wicked problem is a complex human problem situation. 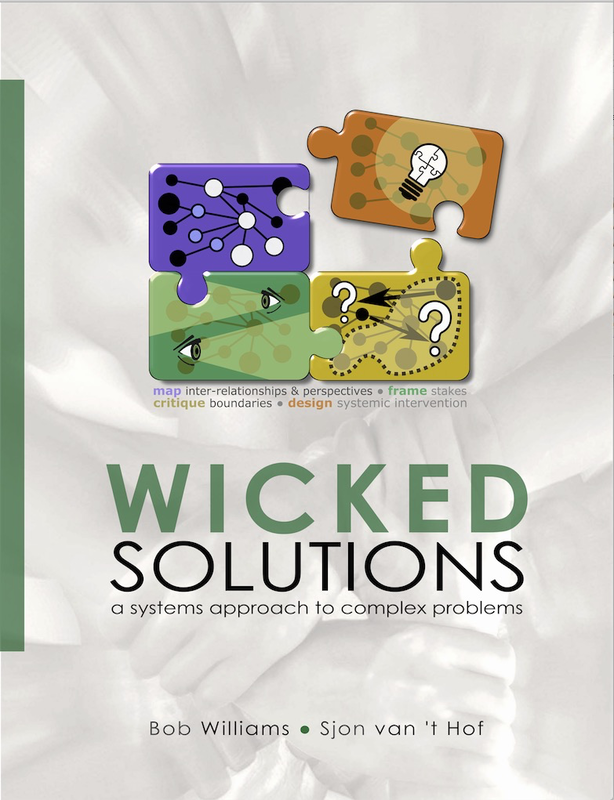 For more information on the nature of wicked problems, click on the link. Systemic inquiry The problem with wicked problems is that they cannot be studied by looking at inter-relationships as subsystems, because we need to keep the context ‘as a whole’ in mind. Not only do subsystems interact with other subsystems, but also with the whole. Now, this ‘whole’ is what every person makes of it, i.e. very much a matter of perception. And one person’s idea of ‘the whole’ can be quite different from that of another person*. So, the best way to go about that problem is to somehow work with the perceptions of key stakeholders. We do that in three ways: (1) the key stakes of key stakeholders are encapsulated in so-called framings, which tell us in a very general way what ‘the whole’ is about; (2) these framings help the stakeholders to outline the actual situation (‘is’) and an ideal situation (‘ought’) that could be the case in say 5-10 years time; (3) the stakeholders then engage in a debate using a set of 12 categorized views (heuristic) and powered by the dialectical tension produced by opposing the actual (‘is’) and ideal situation (‘ought’). * Another reason why it is difficult to study inter-relationships is that they are not all of the same order. In fact, Dana Meadows suggested a 12-level hierarchy (see below), which is one more good reason (only humans can handle that) to work with multi-stakeholder perspectives in a kind of multi-perspective rationality in addition to the whole-system rationality mentioned earlier. Possible clues The dialectic produces a large number of possible clues for understanding the problem and its solution. Only at the very end, it is possible to synthesize a good number of these clues to represent one’s understanding of the problematic situation and to design its correlate, the systemic intervention design or possible innovative resolution. It is important to understand that there is no perfect solution and neither a perfect understanding in the wicked problem. In the first place, we cannot use all clues (or insights) in the final design. And, secondly, no matter how hard we think or try to combine the perceptions of all concerned, we will never know everything, we well always misunderstand certain things. And there exists no expert to prevent us from going wrong. Kauffman’s rules of thumb In 1980, Draper L. Kauffman, Jr. published Systems One: An Introduction to Systems Thinking (see here). It is one of many introductions. At the end of it is a list of 28 of system guidelines or rules of thumb gleaned from books, articles, speeches, and word-of-mouth. Number 8 of them is: “Look for high leverage points.” This idea has been unpacked further by Dana Meadows in 1997/1999, see my brief post or the longish original. It occurred to me that it should be possible to link all this good advice to the basic workings of the systems approach. To some extent this was possible. I made an effort to combine all this information in a single concept map, see below. E.g. Kauffman´s advice 22 was to “beware the empty compromise”, which I could link to the idea of framings (see e.g. this post). It would probably take an excessive twenty pages to describe it all (i.e. 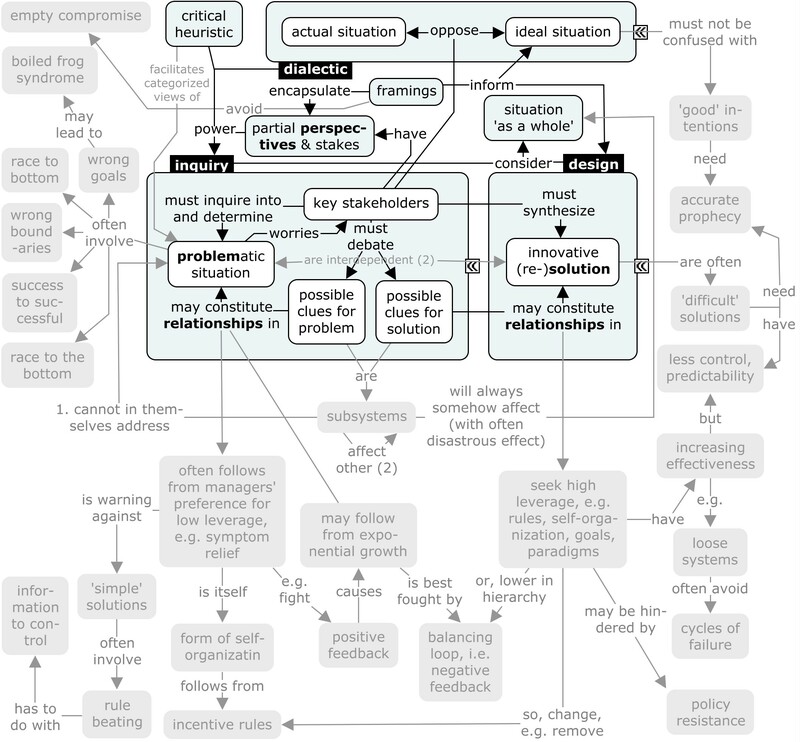 systems approach in relation to the papers of Kauffman and Meadows), so I’ll leave you to just make sense of the concept map. Happy pondering! Indeed, the systems approach is all about meaningful inter-relationships. Meaning depends on context and ultimately on the relevance to the system (problem, intervention) as a whole, the nature of which is to be determined in the process. Human problem situations are very complex, often involving a hierarchy of leverage points that can contribute to the problematic situation or the innovative intervention design. 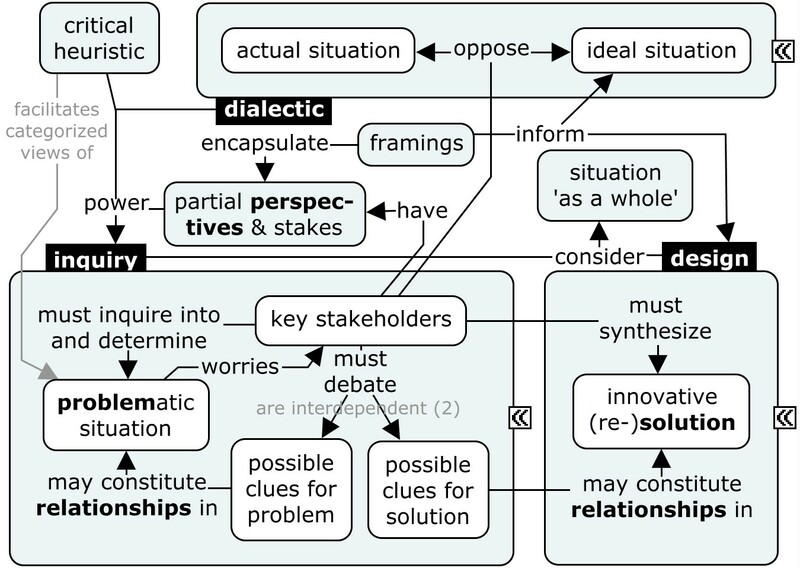 The systems approach is simply a clever way to deal with the complexities of inter-relationships in wicked problems, involving the formulation of ‘common interests’ (framings), critical debate powered by an ‘is’-‘ought’ dialectic and a heuristic of 12 categorized views of the problem. What I forgot to mention is that most people have some notions of Kauffman’s 28 rules of thumb and Meadows’ 12 leverage points, even without having read them or learned about them, academically. This means that people can just apply the systems approach and – especially if they make a team effort with stakeholders – will come up with all the clues and ideas they need for designing a good, alternative way for addressing a human problem situation aka wicked problem. They will get better at it by doing it more often. The systems approach So, then, concludingly, in what way is the systems approach about inter-relationships? I say, the systems approach deals particularly with (improving) how we find, value, combine, use and discard inter-relationships (which we all do all the time). Inter-relationships are like a raw material or natural resource, only extremely diverse and versatile. So we should not compare it to steel as a raw material for cars (or boats, bridges, railways, farm equipment, cooking utensils, tools or bicycles), but rather to a library (only a real live one) for academicians (only real people with real live concerns, like yourself and 7.4 billion others). So, if the systems approach is that important, why do I write about it in this relatively obscure blog? Because I fail to get this message across (because we think we already know how to do it). This failure is perhaps the biggest wicked problem of them all, even trumping the problem of global systemic agency.